Cytochrome oxidase(Cyt.ox. ), which contains heme and copper, is a terminal enzyme of respiratory chain and transfers electrons to molecular oxygen (Erecinska & Wilson 1978). For this reason, monitoring oxidation-reduction state of Cyt.ox. 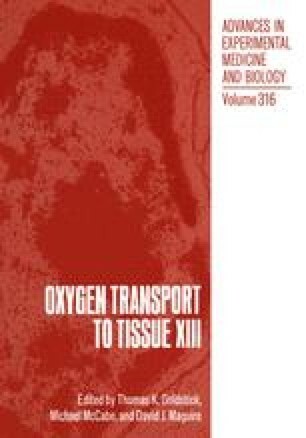 provides the information about the pathologic state of tissues caused by impaired oxygen supply. The Cyt.ox., hemoglobin(Hb) and myoglobin(Mb) have a broad absorption band in near infrared(NIR) region and the light in this region easily penetrates biological tissues. Thus NIR spectrophotometry can measure noninvasively the redox state of Cyt.ox. and oxygenation of Hb and Mb through skin and bone. In this paper, to obtain the mutual relationship between the oxygenation state of cardiac and brain tissues, we examined the redox behavior of copper in Cyt.ox. with anesthetized rat.